Irish, Irish Gaelic, or Gaeilge is a language spoken in Ireland. Irish is a Celtic language. This means that Irish is similar to Scottish Gaelic, Breton, Cornish, Manx and Welsh. Many people who speak Irish can understand some Scottish Gaelic, but not Welsh. This is because the Celtic languages are divided into two groups. One group is called the p-Celtic languages and the other is called the q-Celtic languages. Irish and Scottish Gaelic are q-Celtic languages and Welsh is a p-Celtic language. Irish has no "yes" or "no" words. There were great poets who wrote in Irish. Their poems became the songs of the people. People told stories about the heroes of old times. Many of the poems were about them. At one point Queen Elizabeth I of England and Ireland promoted Irish with a view to using it to translate the Bible into that language and tried to learn it herself. Christopher Nugent, ninth Baron of Delvin gave her a primer about it. Until the nineteenth century, most people in Ireland spoke Irish, this changed after 1801 because after Ireland joined the United Kingdom, its state schools were incorporated into the British system and required to only teach or even allow English speaking. The Roman Catholic Church also began to discourage Irish and Daniel O'Connell, though a nationalist and an Irish speaker himself, discouraged it, because most job opportunities were in the USA and the British Empire. Today, Irish is the first official language of the Republic of Ireland, although in practice English retains a dominant position in government. It is not spoken by most Irish people outside the Gaeltacht for day-to-day life, but a lot of people speak it daily also or when among friends or family. It has to be taught in all schools in Ireland. The newest Gaeltacht in Ireland is on the Falls Road in Belfast City where the whole community has been making Irish their first language for several years. This area is called the Gaeltacht Quarter. There are around 1.5 million speakers. The places where Irish is spoken a lot are called Gaeltachts or, in Irish, Gaeltachtaí. 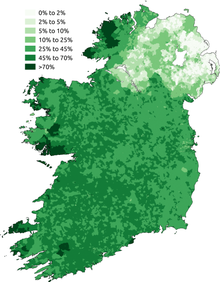 Around 70% of the people in these areas can speak Irish. Ceist ag éinne? = Anyone have a question? ↑ 1.0 1.1 "7. The Irish language" (PDF). Cso.ie. Retrieved 24 September 2017. ↑ 2.0 2.1 "2011 Census, Key Statistics for Northern Ireland" (PDF). Nisra.gov.uk. Archived from the original (PDF) on 8 March 2013. Retrieved 10 June 2017. ↑ Hammarström, Harald; Forkel, Robert; Haspelmath, Martin, eds. (2017). "Irish". Glottolog 3.0. Jena, Germany: Max Planck Institute for the Science of Human History. This page was last changed on 23 October 2018, at 20:01.